When discussing Bryce Harper’s year, the challenge is not to try and show that it’s been great. Rather, the challenge is to show how great his season has been. Harper leads the National League in home runs, and he leads all of major league baseball in batting average, on-base percentage, and slugging percentage, as well. The last player to lead the majors in every triple-slash category was Barry Bonds in his 13-win 2002 season. Only a lack of RBI will prevent Harper from winning a traditional Triple Crown. Perhaps the most impressive number for Harper this season is 204 — that his, his current weighted batting line (wRC+) where 100 equals average. Harper is seeking to become only the 12th player in the last 100 years to hit the 200 makr, and only the 10th in a non-strike season, potentially joining Ty Cobb, Babe Ruth, Lou Gehrig, Rogers Hornsby, Stan Musial, Ted Williams, Mickey Mantle, Mark McGwire, and Barry Bonds. Weighted Runs Created Plus (wRC+) measures how a player’s wRC compares with league average after controlling for park effects. League average for position players is 100, and every point above 100 is a percentage point above league average. For example, a 125 wRC+ means a player created 25% more runs than a league average hitter would have in the same number of plate appearances. Similarly, every point below 100 is a percentage point below league average, so a 80 wRC+ means a player created 20% fewer runs than league average. The chart below shows Off, wRC+ for a small collection of players this season. 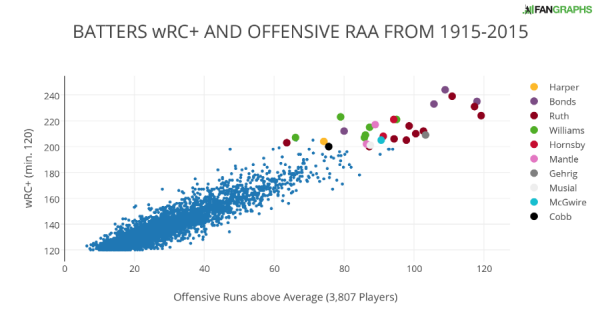 wRC+ is park and league-adjusted, allowing one to to compare players who played in different years, parks, and leagues. Want to know how Ted Williams compares with Albert Pujols in terms of offensive abilities? This is your statistic. 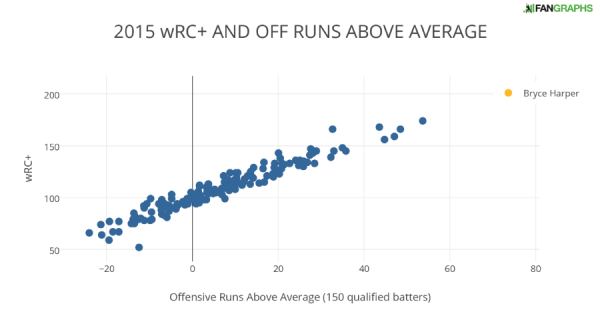 wRC+ is the most comprehensive rate statistic used to measure hitting performance because it takes into account the varying weights of each offensive action and then adjusts them for the park and league context in which they took place. Sean Dolinar made an interesting visual representation back in July using wRC+ in a histogram to illustrate just how far ahead Harper has been this season compared to his peers. 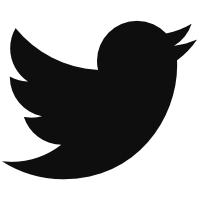 Another attempt to show the same is below. 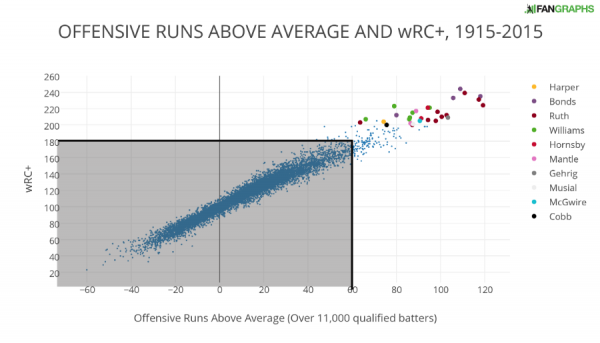 This version of the graph plots all qualified batters this season with their Off and wRC+ numbers as the x and y axes, respectively. The Bryce Harper dot in the upper right is not part of the legend. His dot is just really far away from everyone else’s. The difference between Bryce Harper and Joey Votto in offensive runs above average is bigger than the difference between Votto and eighth-place Andrew McCutchen. The difference between Harper and seventh-place Anthony Rizzo is bigger than the difference between Rizzo and 102nd-place Martin Prado. The difference between Harper and 12th-place Chris Davis is bigger than the difference between Davis and 142nd-place (out of 150) Elvis Andrus. To get to last-place Starlin Castro (24 runs below average offensively), we need only find the difference between Harper and 21st-place Brandon Belt. From 1915 to 2015, there have been over 11,000 qualified batters. The scatter plot below attempts to capture all of them. Despite making the blue dots as small as possible, with more than 11,000 points, the marks tends to blur together. As a result, I’ve added the gray shaded box to denote all points lower than both 180 wRC+ and 60 Off. Inside that box are all but 172 of the qualified player seasons over the past 100 years. Bryce Harper’s year is the only one outside of the box this season. 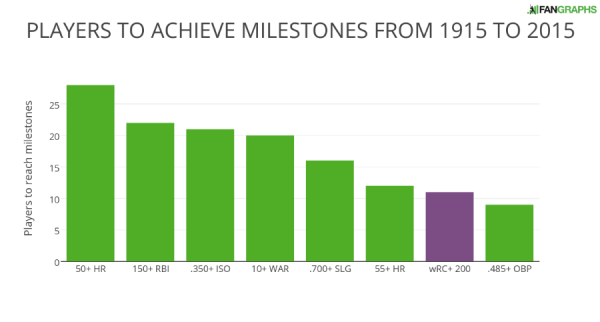 All seasons over 200 in non-strike years (there are only 28 — Frank Thomas and Jeff Bagwell both had wRC+ of 205 in 1994) are signified by bigger markers and the legend on the side indicates which players had those seasons. 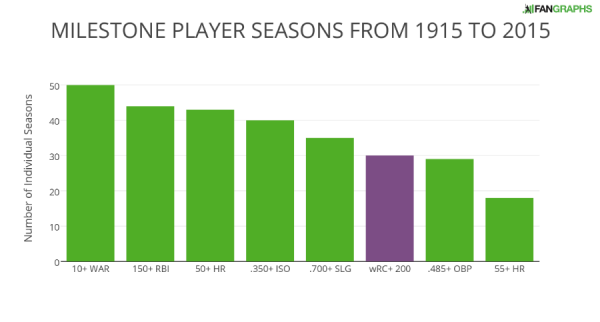 The following graph limits the player seasons to those where the player had a wRC+ over 120. There are more than 3,000 of these seasons, but they should allow for a closer look at the truly elite offensive seasons in baseball. All of the players listed in the legend above are all-time greats. Most of the seasons are in the distant past. After Mickey Mantle and Ted Williams went over 200 in 1957, there was a more than 40-year drought in non-strike years until Mark McGwire hit 70 homers in his historic 1998 season. Barry Bonds followed with multiple seasons of his own. Those two are the only players to reach the mark in the last 58 seasons. Harper would be the youngest player to accomplish the feat, besting Ted Williams’ 1941 season by a little over a month, although both occurred during their age-22 seasons. To provide some context on the rarity of such a season, the bar graph below shows the number of seasons in the past 100 years of several other somewhat arbitrary milestones. The same graph above is repeated below, instead showing the number of players who have achieved the various milestones. Bryce Harper has had an absolutely amazing season, and due to the unfortunate circumstances of the standings, his team has little to play for in the coming weeks. If the past two nights are any indication, Harper has not yet turned his sights to the offseason. Yesterday, I discussed the amazing run of Yoenis Cespedes and similar runs that we have seen this season. Bryce Harper has been on a season-long run that has matched — or arguably been better — than what Cespedes has done since his trade to the Mets. In the context of this season, Harper is chasing an MVP, but looking at his season from a historical perspective, Harper is having one of the very best offensive seasons of all-time. We hoped you liked reading Bryce Harper’s Quest to Join Bonds, Mantle, Ruth by Craig Edwards! Without Harper’s break out season the Nats would be really, really bad, so it should come back to haunt him.